Voorhees Ballet Theatre is committed to preparing students for a serious career in dance. Our dancers have gone on to study at The Central Pennsylvania Youth Ballet, The Pittsburgh Ballet Graduate Program, American Ballet Theater, School of American Ballet, The Joffrey Ballet, Boston Ballet, Princeton Ballet, Kirov Academy, Miami City Ballet, The Harid Conservatory, First State Ballet, The Atlantic City Ballet Company and Nashville Ballet. Below of some of our talented alumni who currently pursuing their passion in the dance world. Caitlin McElroy received her fundamental training at Lowe Dance Studio where she trained in all styles of dance and participated in the Competition Team, Student Teacher Program, and was a member of the Danse Ensemble of the Voorhees Ballet Theatre. At age 16 she was accepted into the year round training program at The Harid Conservatory in Boca Raton, Florida. After graduating, Caitlin spent two years furthering her ballet education in the graduate program at Pittsburgh Ballet Theater School, where she performed in ballets such as The Nutcracker, The Great Gatsby, and Alice in Wonderland. In 2009 she joined the Atlantic City Ballet under the direction of Phyllis Papa and has enjoyed dancing in a wide variety of roles, her favorites being Arabian in The Nutcracker and one of Dracula’s Brides in Dracula. She has toured with the company all over New Jersey, New York, Georgia, Arizona and California. Savannah is currently a high school junior living and studying full time at Walnut Hill School for the Arts in Natick, Massachusetts. Most recently, she performed in The Nutcracker as Snow Corps, Chinese, and the Mouse King. 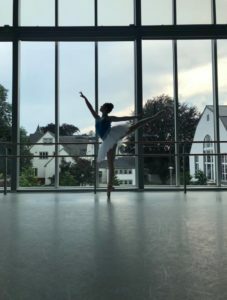 She is preparing for a ballet-focused summer by auditioning for several summer intensive programs around the country, and hopes to attend the program at Ballet Austin again this year. Margaret received her BFA in Dance from Mason Gross School of Arts at Rutgers University. She has performed pieces by renowned choreographers such as Lar Lubovitch, Maxine Doyle of Punch Drunk and Sleep No More, LeeSaar the Company, and Brian Brooks. Margaret has travelled to Beijing, China and Bacolod, Philippines to perform in festivals, and most recently spent 10 days in Portland, OR to work with North West Dance Projects. She currently lives in NYC freelancing and working on smaller projects. After leaving VBT, Emily attended Marymount Manhattan College in New York City. In 2018 she graduated with a BFA in Dance with a concentration in Ballet, and a minor in Arts Management. While attending, she performed works by notable choreographers Robert Battle, Gerald Arpino, Larry Keigwin, May O’Donnell, Pedro Ruiz, Michael Thomas, among others. Emily is currently dancing with the American Swiss Ballet Company and the Peggy Spina Tap Company, both based in NYC. You can keep up with her at www.emilysindoni.com.